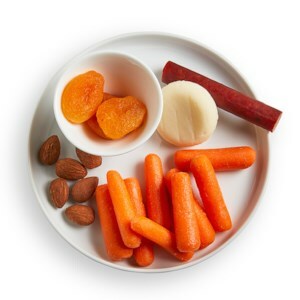 Find healthy, delicious high-protein snacks from the food and nutrition experts at EatingWell. 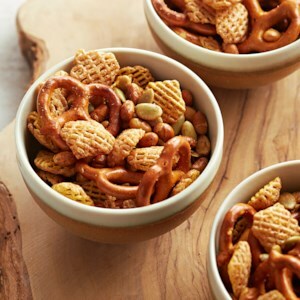 Bringing healthy snacks to work is a good way to stave off hunger pangs and avoid the vending machine. These protein-packed snack ideas, include healthy smoothie recipes (pack them in a mason jar! 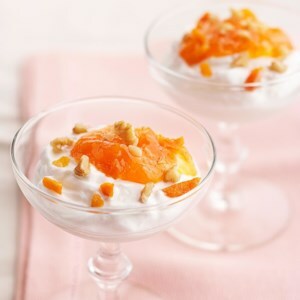 ), healthy nut recipes and more easy snack recipes. They have at least 7 grams of protein per serving to keep you feeling satisfied throughout the day. 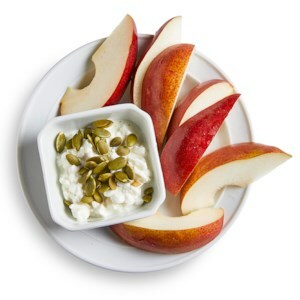 Salty cottage cheese and a sweet fresh pear make this snack satisfying. 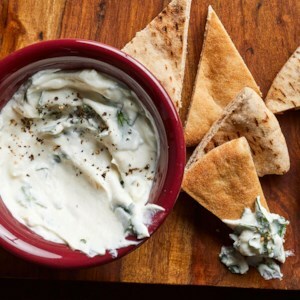 Serve this creamy yogurt dip with baby carrots, sliced radishes or whole-wheat pita triangles. 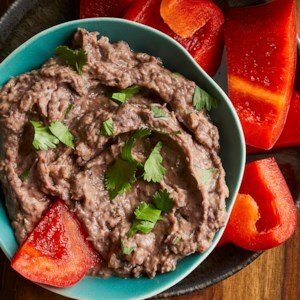 This creamy bean dip is great for a party or picnic. Smoked paprika and ground chipotles add a robust, earthy flavor, but you can also use regular paprika and cayenne if you don't have the other spices on hand. Ceviche is a popular seafood dish in regions of Latin America. 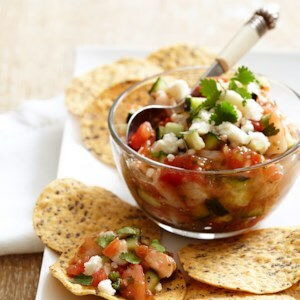 This quick-and-easy version uses cooked shrimp and ready-made salsa, mixed with cucumber and crumbled queso fresco cheese and is served with whole-grain tortilla chips--it's a great light lunch or appetizer for your next dinner party! 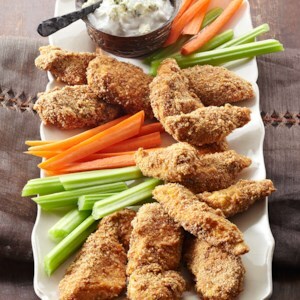 Don't save these wings for game night--they're easy enough to make that you can feel comfortable preparing them whenever you're having friends over. And since they're made with pieces of boneless chicken breast, you can eat them with a fork and eliminate messy fingers! 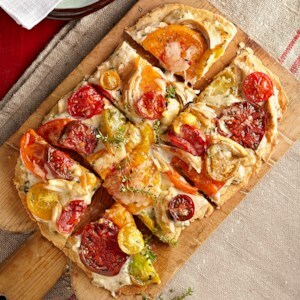 This Country-Style Tomato Tart is made with a homemade a crunchy, buttery cornmeal pastry. Stuffing a whole wheat pita pocket with delicious, healthy ingredients is great way to make an on-the-go breakfast. Plus, these loaded pita pockets are sweet and savory with a tasty crunch! A fun twist on a tuna salad sandwich. 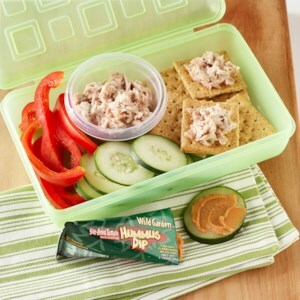 This Tuna Salad & Crackers recipe uses wheat crackers instead of bread! 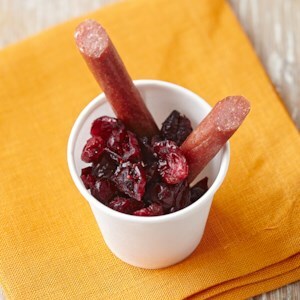 Enjoy Anytime Turkey and Cranberries for a portable, protein-rich, finger-friendly snack. 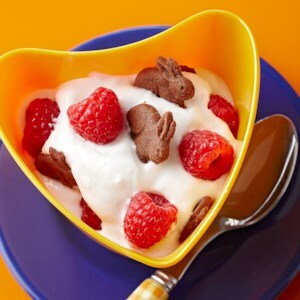 This Crunchy Chocolate-Raspberry Yogurt snack is packed with protein and kid friendly. Bonus! 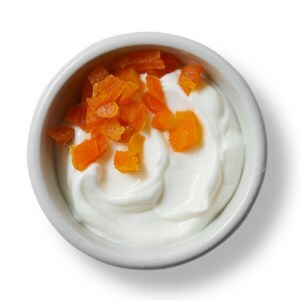 Greek yogurt has twice as much protein as regular yogurt. Late in the summer there's usually an abundance of zucchini and this recipe is one way to use it up. 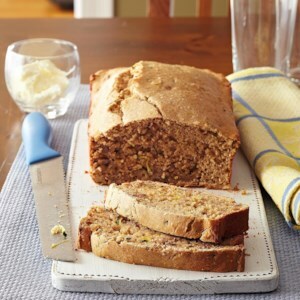 Make a few batches and freeze any extra loaves to have on hand for snacks and quick breakfasts. 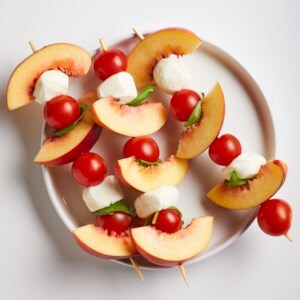 Fresh peaches liven up a classic caprese salad in this super-fast snack. Make this recipe for one or make a bunch for a party appetizer. Don't think you have time for dessert? Try this four-ingredient fruity special. It's super quick to prepare. The lively mix of smoky turkey, light cream cheese and crisp-cooked asparagus in this easy fix-up is sensational. 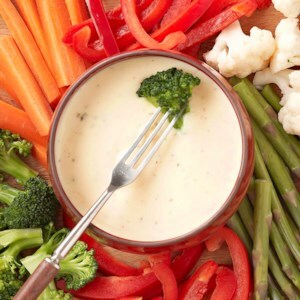 Green apples, broccoli florets and veggie sticks are the perfect dippers for this decadent cheese fondue. 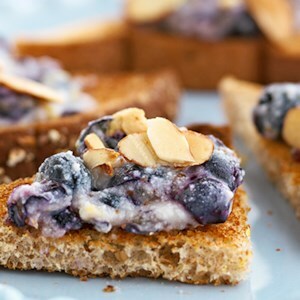 Lemon peel and honey add the perfect flavor combination to this easy appetizer. 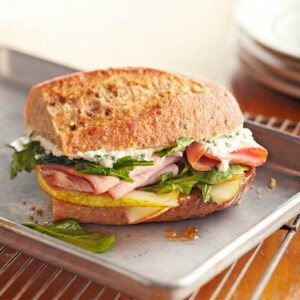 These little ham sandwiches on French bread are topped with pear slices, arugula, and goat cheese. They're best served warm, and are an elegant small bite that's perfect for entertaining.